After Australia suffered its hottest month ever in January when heat records tumbled, they are now being hit with once-in-a-century flooding in part of the eastern Australian state of Queensland and looks set to worsen as the nation’s weather bureau on Saturday warned of more heavy rain in the area. A normal monsoon-burst lasts a couple of days but this one has been going on for than a week now and it doesn't look like its going anywhere anytime soon. 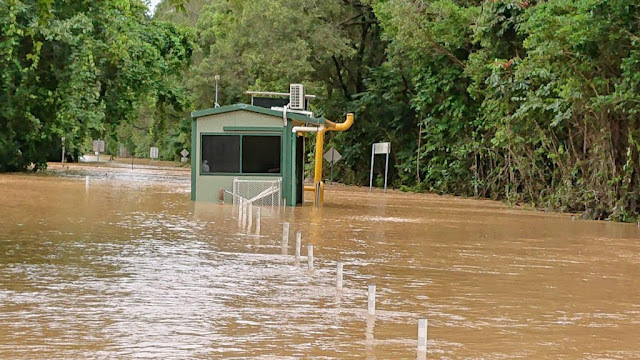 Earlier today, one month's worth of rain fell over parts of Queensland. Local authorities issued a number of flood warnings on Saturday morning and told residents to avoid using roads and consider moving to higher ground if conditions worsen. In stark contrast, wildfires in the southern island state of Tasmania have burnt through close to 190,000 hectares of land, fire officials said. Chris Arnold, the chief officer of the Tasmania Fire Service, said on Saturday that nearly 600 personnel were working to contain the fires, some of which have been burning for weeks and have destroyed homes.